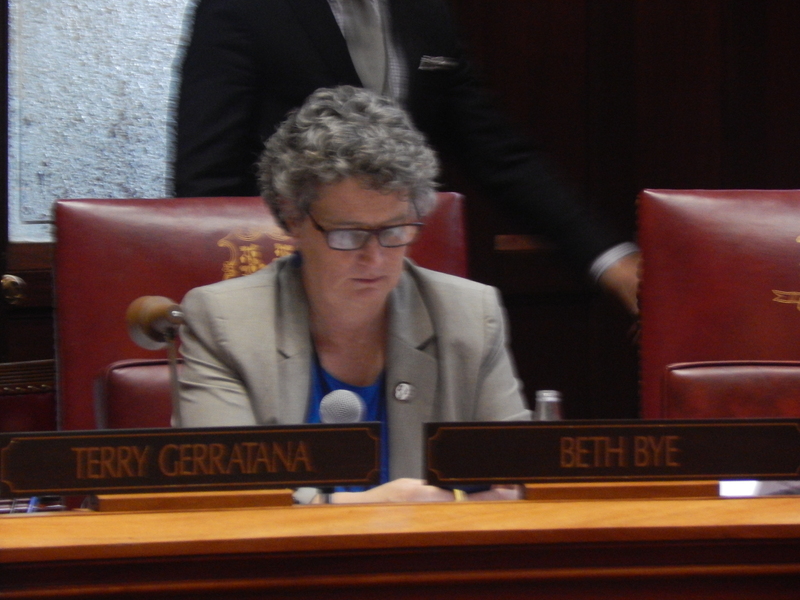 A wide range of legislative priorities that failed to clear both chambers of the General Assembly before the June 3 end of the regular session won final approval early Tuesday as part of a massive budget implementation bill. The 686-page everything-but-the-kitchen-sink bill also includes several controversial new provisions, including a plan to fund pay increases for nursing home workers but give the bulk of the money to those at unionized nursing homes, and one that expands the governor’s authority to hire and fire workers in several types of jobs. Convening in special session, the Senate passed the bill on a vote of 19-17 shortly after 10 p.m. Monday, and the House approved it 78-65 just after 1 a.m. Tuesday. Legislators pass omnibus budget-implementation bills every year, but this year’s measure — known as an implementer — is particularly voluminous, with the guts of many bills that otherwise wouldn’t have become law, as well as provisions that never made it through a public hearing. 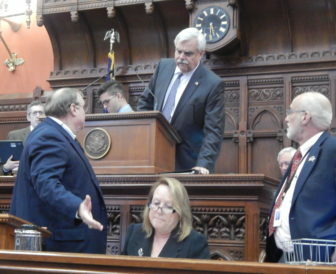 Legislative leaders spent considerable time at the end of the regular session wrangling over the budget and many bills did not get done before the session’s constitutional deadline. “It’s a Christmas tree of sorts,” Sen. Rob Kane, R-Watertown, said during the Senate debate on the measure, criticizing the bill for doing more than what would be needed to implement the budget. A controversial proposal to allow minors with certain debilitating conditions to participate in the state’s medical marijuana program — which was advocated by families of children with debilitating seizure disorders and backed by the state Department of Consumer protection — was included in the initial version of the budget implementation bill. But it was taken out Monday afternoon, before the bill came to a final vote. Here are some of the key parts of the bill related to health care, education, child welfare, labor, environment and other topics. The implementer removes the property tax exemption long held by nonprofit hospitals and colleges for certain facilities, a major priority of House Speaker J. Brendan Sharkey, D-Hamden. A similar measure passed the House, but the version included in the implementer reduces the number of hospitals affected. Under the implementer, only the Yale New Haven Health System and Hartford HealthCare are subject to property tax on off-campus properties acquired after Oct. 1. The two — which together include eight hospitals: Yale-New Haven, Bridgeport, Greenwich, Hartford, Backus and Windham hospitals; MidState Medical Center; and The Hospital of Central Connecticut — are subject to the bill’s provisions because they had more than $1.5 billion in net patient revenue in the 2013 fiscal year. Nonprofit colleges also will have to pay property tax on student housing, although dormitories are excluded. Several of the state’s major colleges would not be affected: Connecticut College, Hartford Seminary, Trinity College, Wesleyan University and portions of Yale, including the college. The measure was developed in response to concerns that hospitals and colleges have been buying up homes and office space that would otherwise be on the tax rolls, reducing municipal tax bases. The budget provides $13 million for pay increases for nursing home workers, but the way the funding is divvied up between unionized and non-union facilities generated controversy. Senate Minority Leader Len Fasano, foreground, stands outside the Senate circle Moday. The implementer doesn’t specify how the funds will be distributed, but says no more than $9 million should go to increases based on costs mandated by collective bargaining agreements. 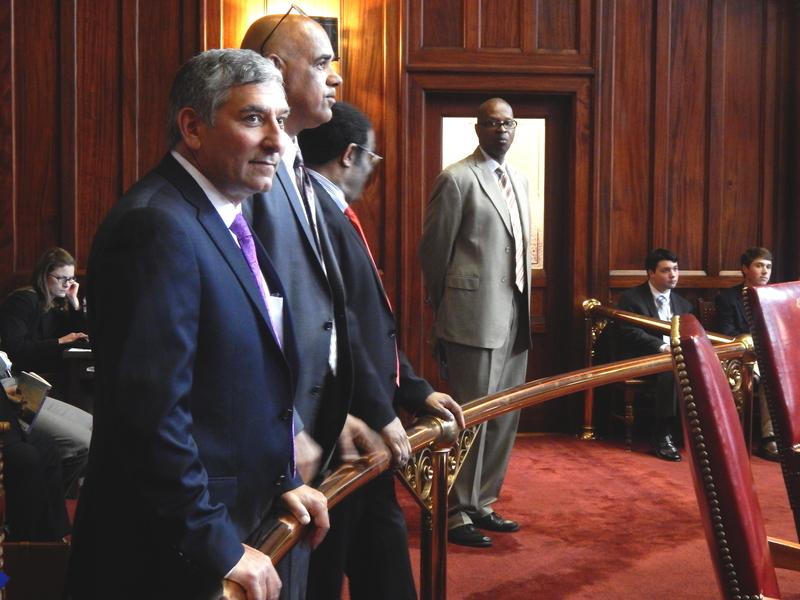 Senate President Pro Tem Martin M. Looney, D-New Haven, said Monday that he believed more than half of the funding would go toward unionized nursing homes. He said that reflected concerns about potential labor disruptions. Unionized workers at 27 nursing homes voted to authorize a strike in April, although they later called it off at Gov. Dannel P. Malloy’s request. Matthew V. Barrett, executive vice president of the Connecticut Association of Health Care Facilities, which represents nursing homes, criticized the potential distribution as unfair. Because only 60 of the state’s 230 nursing homes are unionized, giving unionized homes $9 million would amount to a 5.5 percent wage increase for unionized workers and a 0.75 percent increase for workers at non-union nursing homes, or the difference between 80 cents per hour and 10 cents, Barrett said. Barrett suggested that the policy would violate federal law, and said his organization would urge the federal government — which reimburses the state for about half of its Medicaid spending on nursing homes — to reject any plan to apply the funding unevenly between union and non-union homes. Unevenly distributing the funds based on union status could also put in jeopardy the matching federal funds the state receives for its $1.2 billion annual nursing home spending, he said. The implementer says the commissioner of social services is not required to distribute the funds in a way that jeopardizes anticipated federal reimbursement. Kane, the top Republican senator on the Appropriations Committee, raised concerns about the way the money would be divvied up during the floor debate on the implementer Monday. In response, Appropriations Committee Co-Chair Sen. Beth Bye, D-West Hartford, said the bill was carefully crafted to comply with federal law. Sen. Joseph Markley, R-Southington, tried to amend the bill to require the state to distribute the funds equally among all nursing homes, regardless of whether they are unionized or not. The Senate rejected Markley’s amendment in a 21-15 vote along party lines. The implementer delays certain provisions of a mental health coverage bill that advocates said could significantly improve access to services. The mental health bill, which passed the House and Senate unanimously, requires health plans to cover certain types of mental health treatment. Advocates say it could address a longstanding concern that private insurance plans don’t cover the full range of mental health treatment services that the state’s Medicaid program covers. But critics of the bill have expressed concern some of the requirements could be construed as new insurance mandates, requiring the state to foot the bill for the cost of that coverage. The implementer delays, from Jan. 1, 2016, to Jan. 1, 2017, the coverage requirements for certain services. The insurance coverage requirements for autism spectrum disorder treatments and services for people under 21 are expanded under the implementer, which incorporates provisions of a measure proposed by the Malloy administration. It only applies to about half the private insurance plans sold in Connecticut. Most large companies have health plans that are self-insured and not subject to state regulation. Health care providers have raised concerns for years about the Department of Social Services’ process for handling audits, complaining in particular about the department’s method for determining what a provider owes for mistakes. In one case, a New Haven pharmacy found to have three problematic prescriptions for which Medicaid paid $268.04 was expected to pay $144,814 — the result of a process known as extrapolation, in which the department projects the level of problematic payments across the total value of Medicaid business the provider did over multiple years. Currently, DSS can only use extrapolation if the provider is found to have a sustained or high level of payment errors and hadn’t corrected it after educational intervention, or if the claims are more than $200,000 per year. The bill eliminates those requirements and instead allows extrapolation if the total amount of extrapolated overpayment is more than 1.75 percent of total claims paid to the provider during the period covered by the audit. The bill sets a new minimum wage of $15 an hour for employees of contractors who provide services to the General Assembly’s Office of Legislative Management, which maintains the State Capitol, Legislative Office Building and Capitol grounds. 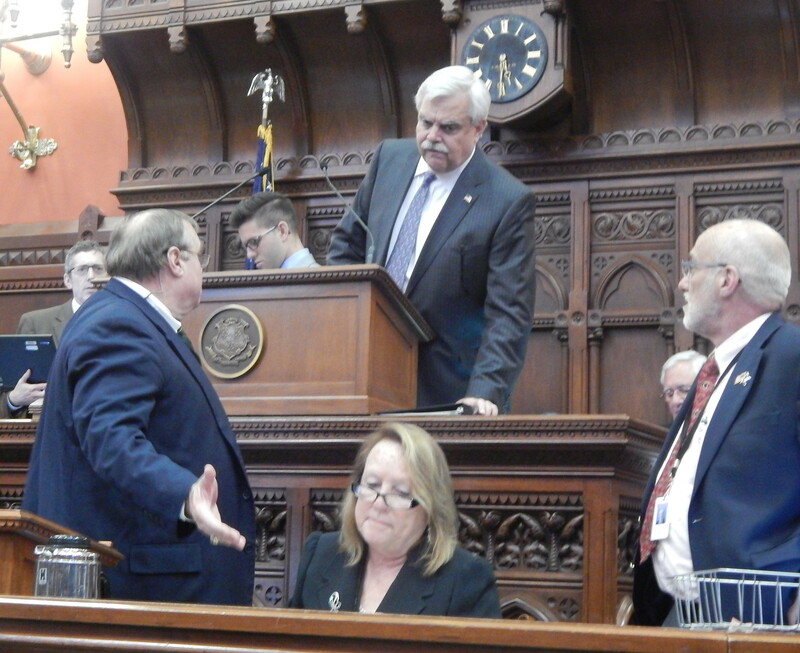 Rep. Bob Godfrey of Danbury presides over the House during Monday’s special session. It directs state officials to study how Connecticut might implement a system to provide paid family and medical leave — the subject of a bill that did not pass during the regular session. The state now has a law requiring certain employers to offer unpaid leave. The governor is empowered by the bill to demand a fingerprint and criminal background check of any nominee for department head or as a judge or justice. The governor also is given the right to hire and fire another half-dozen job classifications, including the executive branch’s liaisons to the legislature. Rep. Peter Tercyak, D-New Britian, co-chair of the Labor and Public Employees Committee, said the latter change would be distressing, since the liaisons often possess an institutional knowledge that survives changes of administrations. Judges, family support magistrates, family support referees and judge trial referees get 3 percent raises in the next two fiscal years. This will also result in pay raises for other workers whose salaries are tied to judges’ pay, including workers’ compensation commissioners and probate court judges. Superior Court judges, for example, are currently paid $162,751 per year; it will rise to $167,634 in the fiscal year that begins Wednesday and $172,663 in the following fiscal year. The budget includes $1 million in the 2016 fiscal year and $2.4 million in the 2017 fiscal year for the raises. The bill expands the number of schools that can join the group of low-performing schools targeted by the state for intervention and resources known as the Commissioners’ Network. The implementer removes the limit that only four schools in a district can be in the network at once and the 25-school statewide limit. This potential expansion comes despite a cut in state funding for the network next year to $12.8 million, a 27 percent reduction. The network has struggled to expand in recent years. “The Department did not have the capacity to take on more schools and provide the level of intervention needed,” Education Commissioner Dianna Wentzell informed the State Board of Education last month. Suburban districts that enroll city students in their schools through the Open Choice program become eligible to be reimbursed for some of the costs to provide these students transportation to school. State-funded scholarships for students attending Goodwin College will be capped at $673,000 beginning next year. This fiscal year, students attending the private college in East Hartford received $1.8 million in need-based aid from the state, or nearly 5 percent of the Governor’s Scholarship fund. Special education teachers will have to take at least one course in classroom techniques in reading, differentiated instruction, social-emotional learning, cultural competencies and assistive technology. The bill also clarifies that parents have the right to attend all meetings where their child’s special education plan is being discussed, reviewed and revised. Several changes are made in an effort to improve the education of students who speak limited English. English learners will be able to continue taking bilingual education courses for up to 60 months as opposed to the current 30-month limit. To ensure these courses don’t become a dumping ground, districts will need permission from the State Department of Education for students to continue in these programs after 30 months. A pilot program is also created in four districts with high concentrations of English learners. The bill also makes it easier for bilingual teachers to become certified to teach in the state. The state will take over the operations of Winchester School District, a small district in Northwest Connecticut that enrolls about 700 students and is one of the state’s lowest-performing districts. The district has struggled to manage its finances to the point that the legislature has ordered the state’s education commissioner to appoint a receiver to run the district for at least the next two years. Regional magnet schools, except in the Hartford region, that currently offer free preschool, must begin charging tuition of up to $4,053 a year to families that can afford to pay something. The bill also provides $150,000 to create a pilot program to improve the educational outcomes for some foster children living in Middletown, Norwich and Willimantic. The Department of Children and Families currently employs 12 people whose job is to oversee the educational services and outcomes of the nearly 4,000 foster children and offenders in state custody. This pilot will expand the number of people overseeing the educational services for foster children. The implementer also provides an additional $95,000 for a new Youth Service Bureau in the state to help divert more young offenders from juvenile court. The bill includes two environmental measures that received substantial attention without coming to final passage during the regular session: one phasing in a ban on the use of microbeads in cosmetic and personal care products; and another restricting the use of pesticides on municipal playgrounds. Plastic microbeads used as skin cleansing agents pass intact through wastewater treatment plants and have been found in fish and other wildlife. Connecticut is one of several states that have been looking to ban them. The ban here is to be phased in between Dec. 31, 2017, and Dec. 31, 2019. The new pesticide restrictions apply to outdoor play areas in municipal playgrounds, but exempts sports fields and school playgrounds. Existing law already restricts pesticides on the grounds of schools educating children up to and including the eighth grade. The implementer also contains pieces of what had been a large energy bill designed to begin modernizing Connecticut’s electric grid. A key resurrected provision limits the fixed charge all electric customers pay regardless of how much power they use. The provision defines what can be included for reimbursement in that charge. It does not go as far as the original legislation, which would have capped it at $10. It also allows the utilities to begin a pilot program for large-scale energy storage, a relatively new concept designed to make more and less-expensive power available at critical times of the day. But most of the grid modernization plans will be implemented administratively rather than through legislation. The implementer also expands the state’s farmland restoration program to include shellfish beds. The legislation reconfigures and expands the jurisdiction of the quasi-public Connecticut Port Authority, which was authorized by a law passed last year and does not yet exist. The new version gives the port authority control over state harbors as well as ports and transfers jurisdiction over maritime and other related laws from the Department of Transportation to the authority. The General Assembly continued its long history of honoring the deceased by naming bridges, byways and, this year, a coffee stand. Gustave Whitehead, a designer of an early airplane that some legislators say gives Connecticut a claim of being first in flight, gets no recognition from the Smithsonian, but a coffee stand in the Legislative Office Building soon will bear his name. Exempt Department of Motor Vehicle inspectors performing their official duties from the state law prohibiting the use of hand-held cell phones while driving. Exempt the Department of Revenue Services commissioner, when issuing formal interpretations of tax law, from having to publish notice of impending changes or from having to submit proposed changes to the legislature’s Regulations Review Committee. Extend the First Five economic development program for one more year through June 30, 2016. Require landlords to disclose in tenant leases whether a unit has a working fire sprinkler system. Allow municipalities to abate up to 100 percent of a natural gas company’s personal property taxes for as many as 25 years to facilitate natural gas expansion projects. Expand the definition of racketeering to include counterfeiting cigarette tax stamps, using such counterfeits to evade the state’s cigarette tax or possessing, transporting or offering for sale 20,000 or more cigarettes in any unstamped packages. Correction: As originally posted, this story referred to microbeads and pesticide legislation as not coming to a vote in the regular session. Each passed one chamber.